The true test of how much the Bulldog volleyball team has improved over the course of their regular-season district slate came with the start of Game Three Thursday at Bulldog Pit. Having bested Goddard 25-20 in the opening set, the ‘Dogs found themselves edged out in the second, 23-25, and the match tied at one-all. The Rockets were riding high following the win, a situation similar to that which Artesia faced Oct. 18 on the road. There, the Bulldogs had seen a 2-0 lead fade into a five-game loss as Goddard translated their adrenaline to results on the court. But although the Rockets jumped out to a 5-3 lead in the early goings of the third set Thursday, the ‘Dogs’ determination was visible. And once they righted the ship with a 25-22 victory in Game Three, they never looked back, finishing Goddard off 25-21 in the fourth set for the 3-1 win. With that, Artesia locked up the regular-season district championship with a record of 16-4, 5-1 in D4 play, as well as the top seed heading into next week’s district tournament. The Artesia girls came out a bit shaky to start Thursday’s match, falling behind the Rockets 5-9 on a few defensive miscues. A kill following a long volley by Kamryn Carrera sparked the Bulldogs, however, who went up 14-11 midway through with help from a Stacia Martinez four-point service. Goddard was able to keep it close as the teams traded side-outs, but Kamryn Equibel would serve out the set with Kaci Thurman delivering the game-ending kill on a one-touch hit over the net, 25-20. The ‘Dogs found themselves in an early hole once again in Game Two, however, and in a bout that was largely defensive till the end, they couldn’t put together the run they needed to clamber out. With the Rockets up 19-12 late, Mattie McCombs stepped to the line and served up three straight, punctuated by a Martinez kill and a block from Paityn Houghtaling to make it 19-16, and three more from the line by Esquibel tied the game at 20-all. 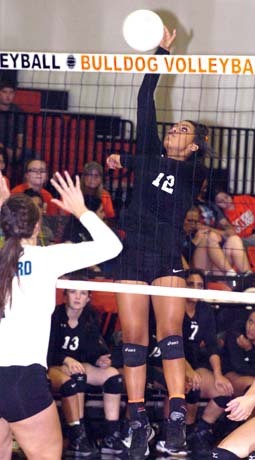 Morgan Gutierrez was able to force a Rocket side-out to return the ball to Artesia for a Martinez point, but an offensive error and a pair on D helped Goddard seal the deal on the 25-23 win. The Bulldogs would bear down in the third set, however, fueled by early four-point services by Kyrah Gonzales and Thurman, along with solid hits from Gracie Puentes, Dezaray Boyce, Carrera and McCombs. That gave Artesia a three- to four-point cushion they were able to cling to through the side-out-riddled final moments of the contest for a 25-22 win. And with the Rockets on the ropes, the ‘Dogs did the bulk of their damage early in the fourth set, as Thurman served up nine straight with kills by Puentes and Carrera sprinkled throughout. Goddard challenged late with four consecutive points of their own, but a hit out of bounds and a Martinez spike closed the book, 25-21. Boyce finished the evening with 13 kills, Martinez logged 11 and 19 digs, Alexa Riggs had a stellar night on D with 37 big digs for the Bulldogs, and Gonzales and Esquibel finished with 26 and 18 assists respectively. “We played really good defense last night,” said Williams. “There were a lot of long rallies. Both teams were keeping the ball off the ground really well, and a lot of times, we were just able to keep it up and allow them to make a mistake or give ourselves a chance to put it away. With the No. 1 seed in the D4 Tourney, the Bulldogs earn the right to advance directly to the championship match, set for 6 p.m. Saturday, Nov. 5, at Bulldog Pit. The winner of Tuesday’s match between Lovington and Goddard will advance to a Thursday showdown with Roswell High, and the winner of that contest will move on to challenge the ‘Dogs.